The concept of replacing worn or damaged joints with artificial joints is well accepted. Most people will know somebody who has had a hip or knee replacement and other joint replacements, such as shoulders or ankles, are now undertaken routinely. For almost as long as surgeons have been replacing hip and knee joints there have been attempts to replace damaged discs in the spine, but until recently these attempts have been frustrated by technical and mechanical problems encountered in the lower spine . Surgical advances and engineering developments in recent years have overcome these problems and made the possibility of disc replacement a reality. Rationale : - Total disc replacement is undertaken to help with symptoms of back pain (and sometimes with leg pain symptoms too) arising from a disc which has become worn and damaged. Pain may be coming from the damaged disc itself as well as from other structures such as the small joints at the back of the spine (the facet joints) which can become overloaded as the disc collapses and narrows. This narrowing of the disc, which occurs as the degenerative disease progresses, causes the vertebra above to sink down towards the one below putting extra pressure on the facet joints. The loss of disc height also reduces the size of the openings to either side where the nerves leave the spine, called neural foramen. This may pinch the nerve roots adding leg pain, and sometimes other symptoms, to the problems experienced with a degenerative disc. 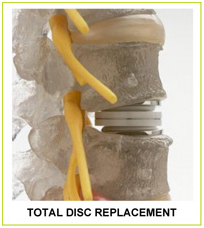 Disc replacement surgery corrects these various problems. The pain generating disc is completely cleared away. The artificial disc inserted in its place mimics a normal healthy disc, restoring normal movement at this part of the spine and avoiding the transfer of stress to other parts of the lower back. The height of the disc is returned to normal too, off-loading the facet joints and opening out the neural foramen on either side. The Artificial Disc : - There are three parts to the Charité (pronounced share-ih-tay) artificial disc, two metal endplates and a central plastic core. 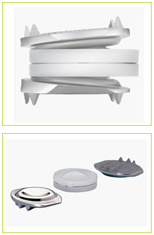 The metal endplates are made from cobalt chromium alloy, a material which has been thoroughly proven in hip and knee replacements. The outer surfaces, which are positioned against the vertebral bodies, are porous to allow the bone to bond to them very firmly. This is helped by several teeth which project out and give immediate fixation to the bone. The inner surfaces are highly polished concave dishes, allowing movement with the central core. The core is made from polyethylene, again well proven in other joint replacements, with domed upper and lower surfaces which fit within the concave dishes of the endplates. How is the Artificial Disc adapted to an individual? It is important to select the right implant for an individual. The dimensions from side to side and from front to back will vary according to the height and stature of an individual but will also depend on the level of the disc being replaced. The same factors will also affect the height of the implant. It is also important to restore the normal amount of wedging between the back and the front of the disc, called lordosis, since this can affect overall balance and have an impact on other parts of the spine. There is a wide range of sizes available. During the operation, trials are used and checked visually and with x-ray control to ensure the optimum size, height and lordosis is chosen and that the implant is correctly placed. The operation normally takes about two hours for a single level disc replacement and about three and a half hours if two discs are being replaced. Where is the incision made? The operation is done from the front, through the lower part of the abdomen, the patient being placed on his or her back. 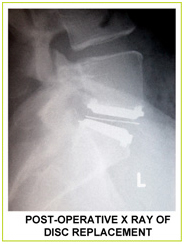 The incision may be horizontal or vertical and its position will depend on the level of the disc being replaced. For the L5/S1 disc it is usually a little above the top of the pubic hair line but a few centimetres above this for the L4/5 disc. The incision can be as little as 5 or 6 cms (2 inches) in a slim patient. What happens during the procedure ? After making the incision the anterior abdominal muscles (the 'six-pack' muscles) are separated and the peritoneal sack, containing the abdominal organs, carefully moved to one side. A marker is placed on the disc and an x-ray obtained to confirm the level where the disc replacement is to be inserted. The large blood vessels in front of the spine are then carefully moved to give the necessary access to the disc. The central section of the disc is then removed and the vertebrae spread apart to allow access to the very back of the disc which must be carefully cleared away to ensure good movement of the artificial disc. The appropriate size and lordosis of the disc replacement is then determined using x-ray control, which is also used to ensure very accurate placement. This is an important technical step which we know affects the long term functioning of the disc replacement. The endplates are inserted into the disc space, being pressed home and held in position by the protruding teeth and the inherent pressure of the spine. Placement is meticulously checked, millimetre by millimetre, as the disc replacement is inserted. Once in place the core is inserted and a final check of the prosthesis is made. What is the period of hospitalization? Most people are able to go home after about four days for a single level disc replacement and perhaps five days if two levels are replaced. What can I expect in hospital after the operation? You will probably be quite surprised at how quickly and easily you will be able to get moving after the operation. We will usually aim to get you up, standing and taking a few steps later the same day or the day after the operation. Your wound will be protected by a waterproof dressing when you go in the pool. As your mobility improves you will be encouraged to take regular short walks. You will start a programme of core stability physiotherapy exercises, which are very important, and these will continue after you go home. Your therapist will show you ways to protect your back while doing everyday things such as getting in or out of bed, dressing, getting up out of a chair or getting into a car. The nursing staff will work with you to try and ensure that any post-operative discomfort is kept to a minimum. Initially this may be through the use of pain killing medication through a line which you control through the simple press of a button (Patient Controlled Analgesia, or PCA), but quite quickly you will be able to switch to simple tablets. To minimise the risk of a deep vein thrombosis (DVT), which is the formation of a blood clot in one of the deep veins in the leg, you will be provided with special elasticated stockings. When you are resting in bed you will be fitted with A-V impulse boots and we will ask you (and remind you) not to cross your legs and to do special foot exercises. All these measures help to reduce the chance of a thrombosis forming, as will walking which is another reason we encourage you to get up and start mobilising quite early. The position of the disc replacement will be checked very carefully under x-ray control during the operation but a check x-ray will be obtained, usually the day after your operation. Once you are comfortable and happy with your ability to get around you are about ready to go home. This is usually by about the third or fourth day after your operation. By this stage you will be safe to sit, walk and travel in a car for moderate periods. Will I need a brace? No, there is no need for a brace after disc replacement. What will my convalescence involve after leaving hospital? The Surgical Wound : - The clips are removed once the wound has healed, usually at nine days after your operation. This is not uncomfortable and is very simple. You can either come into the hospital or we can arrange for your district nurse to remove the clips for you at home. Activity and Movement : - You will need to continue with your programme of active home exercises and supervised physiotherapy after your discharge from hospital. This will usually involve attending the physiotherapy department about twice a week, either at Hospital or locally to your home. Initially your physiotherapist may use treatments to help settle soreness and muscle spasm and bruising from the operation. Regular walks are also helpful. You will be taught what to do to protect your back and how to position yourself when you sit or lie down. Quite soon you will move onto more active treatments to build up your strength and improve your flexibility. It can be quite daunting when you first start gentle bending. Working steadily on both strengthening and movement exercises will soon instil confidence and gain flexibility. Endurance exercises such as treadmill walking and static cycling further help muscle strengthening. Our physiotherapy department has developed a detailed protocol for treatment after disc replacement and are always happy to discuss this with your own physiotherapist. Driving and Travel : - You can return to driving as soon as you feel reasonably confident about getting in and out of your car and happy that you will be able to sit comfortably for the necessary time. You shouldn't drive if your concentration is impaired, for example if you are uncomfortable, or if you are taking medication which might make you drowsy. The same guidelines apply to airline travel, although you should avoid very long haul flights for the first three months after surgery because of the risks of a deep vein thrombosis. If you do plan to travel take an aisle seat so you can get up for a stretch and do a little walking periodically, and wear your elasticated stockings. Keep yourself well hydrated and consider taking half an aspirin a day, starting a few days before your trip. These measures help to reduce the risk of DVT. Sports and fitness training : - You will probably be able to return to light aerobic fitness training at your health club about six weeks after your surgery. 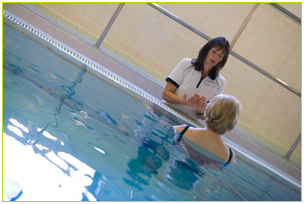 You can discuss appropriate exercise with your physiotherapist. It is best to wait until about three months before returning to golf and competitive sports. Return to Work : - You will be able to consider returning to light semi-sedentary work in three to four weeks but if your work is more physically demanding you may benefit from a longer period of recovery. In the weeks after an operation you will tend to tire more easily and it might be better to return on a part time basis initially. What to expect in terms of symptoms after your surgery ? Although the recuperation after total disc replacement is relatively quick, you are certainly likely to be aware of some discomfort and soreness deep in your back. The wound itself will also feel quite sore and the tummy muscles around the wound will feel bruised and tender initially. These problems will gradually improve over the days and weeks following your operation. Another cause of some lower back discomfort after disc replacement can be the facet joints which have to get used to the slight readjustment of the vertebrae and often a rather improved range of movement compared to what they have been used to. These symptoms will again usually settle, but if they remain troublesome occasionally we will suggest some facet joint injections. It is not unusual to experience some leg pain on one side or the other. 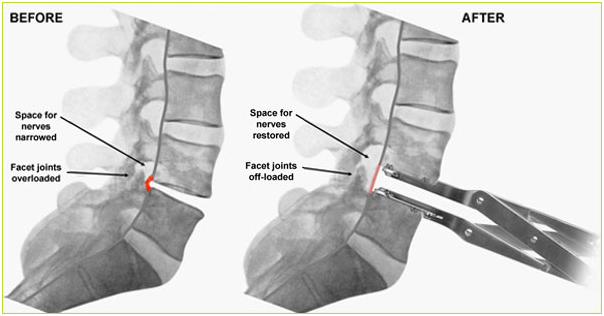 As the disc height is restored during the operation the nerves close to the disc may be stretched a little at first. There will also be some bruising around the disc replacement which can slightly irritate the nerves a little. Almost invariably these symptoms will pass after a few weeks. If you are worried or the symptoms are very troublesome contact your GP or Mr Boeree's office. When you leave hospital we will contact your doctor to ensure he or she is fully aware of the operation you have had and any necessary care needs you may have. If you have clips to be removed we will arrange for this to be done at the hospital or by your district nurse. You will be sent an appointment to be seen by Mr Boeree at six weeks after your operation. Your physiotherapist will, in the meantime, have kept Mr Boeree informed about your progress. You will have a further appointment with Mr Boeree at three months from your operation, at which point X-rays will be obtained to check on the artificial disc and how it is functioning. During this time if you have any concerns please feel free to contact Mr Boeree's office, although it is often worth discussing these first with your physiotherapist or GP.